Everybody needs help at some point in their life. Sometimes you need to turn to a trusted legal professional who has the wisdom and experience to solve a situation. Iam Philip Vint, the Principal of the firm. I work closely with each of my clients. I do not use a buffer of assistants and associates. I pick up my own phone and return my own messages and emails. I am easy to talk to, no matter the topic. I have the experience and confidence you are looking for in a solicitor. Philip is a pleasure to deal with, very professional and leaves no stone unturned, highly recommend Philip for any legal matters. 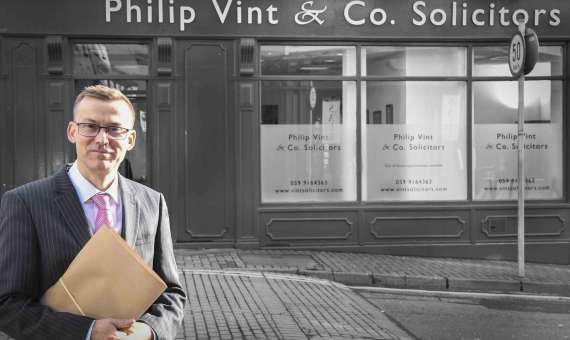 It was a pleasure to use Philip Vint as my solicitor recently! Having used other solicitors in the area I would highly recommend him over the others! Very professional with excellent communication throughout the process. A very pleasant man also. I had the great pleasure in using Philip’s services as a solicitor recently. I’ve used various solicitors over the years and Philip stands out as being the best experience I’ve ever had with one. Besides being excellent at his job, he explained everything in terms I could understand, there was no hidden fee’s and was very clear on what costs were involved. His dedication, excellent communication and knowledge of the issues around my legal needs seriously impressed me. He gave me great peace of mind in dealing with my legal issue and I can highly recommend him if you need a solicitor. Many thanks Philip. I received brilliant support from Philip Vint & Co solicitors following a road traffic accident. The quality of knowledge and friendliness of staff was exceptional. Philip provided advice and good communication throughout my claim. I would gladly recommend Philip Vint & Co solicitors. I had an accident on my motorbike which I did not cause. I only had 3rd party insurance and was told by both my own and the other person’s insurance company to go away. I knew this was wrong. A friend recommended Philip Vint to me. Philip understood what I was going through and sorted it all out. We found Philip to be professional, thorough and helpful. He communicated with us clearly throughout the entire procedure and advised careful consideration where necessary. We would have no hesitation in using Philip’s services again and would highly recommend him to family and friends. Philip was thorough and efficient and most pleasant to deal with. Costs were kept to a minimum thanks to his capability. We are more than happy to recommend Philip Vint Solicitors for legal services. We would highly recommend Philip. He is prompt, precise, polite and a pleasure to deal with. We were impressed with his eye for detail and efficiency. We wish him all the best for the future. I have recently used Philip Vint & Co solicitors as I was in road traffic accident. I was recommended to Philip by a family member who had used him in the past. I found Philip to be very pleasant and informative throughout the time my case was being processed. He gave me good advice and kept in contact on a regular basis. I would most definitely recommend Philip Vint & Co solicitors to my friends and family and if I need legal advice in the future I shall return. My case was successful and I was very happy with my settlement as it was more than I expected and did not take as long as I thought it would. I found my experience with this establishment to be very pleasant. Clarity, patience and meticulous attention to detail are just some of the positive attributes Philip Vint demonstrated when he was acting for me. It was so reassuring to have him take care of the important details. I would highly recommend him. Philip Vint previously looked after a matter for me. It was not straightforward and I am delighted Philip was the solicitor taking care of this work. His attention to detail is second to none and I can also testify to his timeliness. The work took place over the summer months but this in no way effected his ability to ensure every paper that crossed his desk was examined in detail and turned around in excellent time. He also established a fair cost at the beginning. He is a very personable man and this was the most efficient and satisfactory dealing I have had to date in relation to legal matters. I recently contacted Philip with regards to an outstanding client invoice. The invoice had been outstanding and despite a number of conversations with the client, no payment had been made towards this debt. Given the value of the debt, Philip advised me that it may not be worth incurring extra costs to chase payment. However in this particular instance it was more a matter of principle that concerned me rather than the value of debt. Philip sent a strongly worded letter to the client and the very next day he called Philip to propose a payment plan. I was delighted to see such an immediate response given the time I had spent chasing this. I was very pleased with the service that Philip provided. He set out exactly what would be involved in taking action to recover this debt and what the outcome might be should I go ahead. He also dealt directly with the client so that I did not have to have further contact with them. Philip was also very open and although he advised me that it may not be cost effective for me to pursue the debt, he was also understanding of my reasons for doing so. I would have no hesitation in recommending Philip for any legal matter be it big or small. Vint Solicitors represented us during the purchase of our first home. This was a daunting process which Philip at Vint Solicitors guided us through keeping us updated and informed at all points. From the outset Philip provided us with the information we needed to make informed decisions. He explained all the complexities of this process to us in terms we could understand. 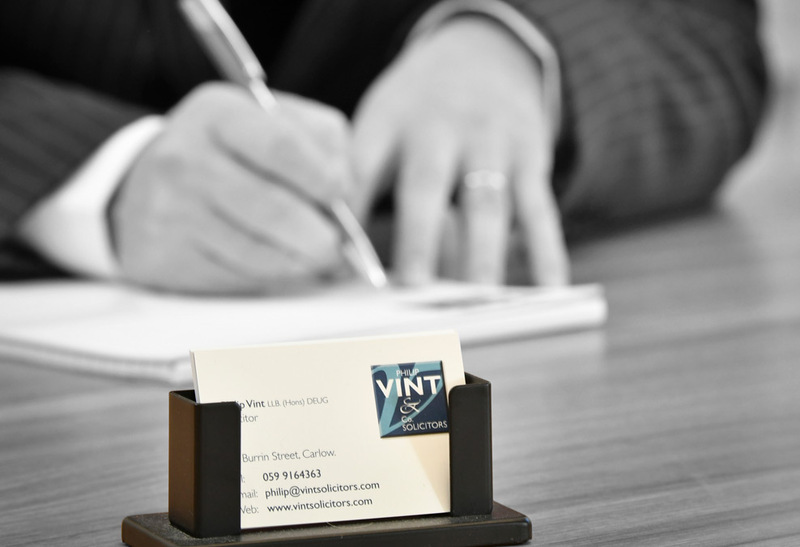 Vint Solicitors’ central location in Carlow town also made it easy for us when we needed to drop in to meet Philip or sign documents. Philip was very thorough in his work. We would highly recommend him and intend to avail of his services again in the future. I have employed Philip Vint & Co. Solicitors on a couple of occasions and I always received a friendly, reliable and informative service. Mr. Vint always ensured I completely understood the process he was undergoing on my behalf. If I ever had any queries it was a simple phone call or email and my questions were always answered immediately. The costs were transparent from the initial consultation and very reasonable. There were no hidden charges which took a lot of stress away. I would have no hesitation in recommending Philip Vint & Co. Solicitors to anyone as I am sure they would receive a service second to none. My name is Bryan Corden and I am a director of Deycom Computer Services Ltd. As a company we pride ourselves on the level of service we provide to our clients and we actively seek out suppliers who also aim to offer the same high level of service. I am delighted therefore to be able to give this testimonial to Philip Vint of Philip Vint & Co Solicitors. When we recently required assistance with some legal matters we engaged the services of Philip Vint & Co Solicitors and we were extremely impressed with the efficient and prompt manner in which Philip Vint dealt with our issue. Philip always communicated with us in a timely and professional manner and we will certain use Philip for all our future legal issues. 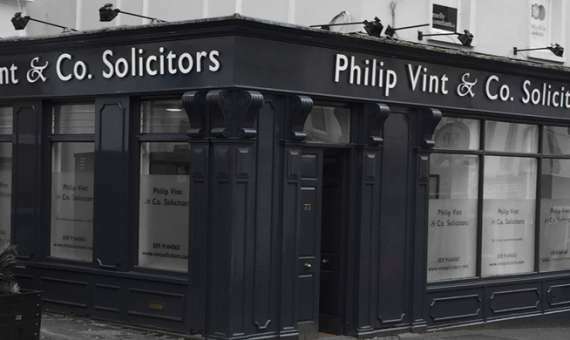 We would highly recommend Philip and his firm Philip Vint & Co Solicitors to any company or individual who is looking to engage the services of a solicitor. ABOUT PHILIP VINT & CO.
We pride ourselves on an efficient and practical service which puts clients first. Philip Vint, the Principal of the firm, qualified as a solicitor in 1994 and has over two decades of solution based experience. Philip has a reputation for looking after his clients with the utmost care and friendliness while at the same time delivering the highest professional quality. We have a transparent policy on costs and would be more than happy to discuss this with you. Philip Vint & Co. Solicitors are offering Mediation Services. The Mediation Act came into force in January 2018 and represents a game changer in terms of all types of conflict resolution in Ireland.